1. What Makes BinaryInternational Different Than Other Brokers? 2. 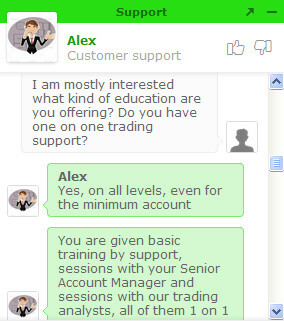 What Binary Options Trading Education BinaryInternational Offers For Newbies? 3. Is there any bonus program for new clients on BinaryInternational? How big is the bonus wager? 2-Color Copy of the Credit Card (Front and Back) used to fund the account showing: The last 4 digits on the front of the card and the signature on the back of the card. BinaryInternational is new and interesting broker based on TechFinancials platform. However lacking of regulation and its offshore position can open some risks. 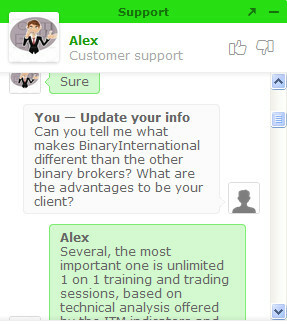 The chat with BinaryInternational support was good and not difficult to make. The BinaryInternational representative was polite and the responses were fast. However I can’t find something different and more appealing for this broker. We will continue to monitor them, but for now it is difficult to say anything more specific. Visit the Complete BinaryInternational Review by Martin Kay.